America’s flagship ‘clean coal’ project cannot burn coal and turn a profit, its chief executive has said. In an earnings call late last month, Tom Fanning – CEO of Southern Company – said the Kemper plant in Mississippi cannot currently afford to gasify lignite in the gasifiers it spent most of $7.1 billion to build. This comes as President Donald Trump has called for ‘beautiful clean coal’ and leading coal firms such as Peabody are attempting a dramatic rebrand. Fanning, who has tried to pin the blame for the Kemper catastrophe on state regulators, called the low gas price “an overwhelming change”. The Kemper project, which has been troubled from the outset, is years late and billions of dollars over-budget. Last year Unearthed revealed that Southern, with the backing of the US government, was trying to sell their CCS technology to countries around the world even when they knew of its profound problems. In an apparent first salvo in a public relations campaign to shift blame for the Kemper power plant boondoggle away from himself and corporate management and onto state regulators, Southern CEO Tom Fanning admitted that the Kemper plant is not economically viable as a coal-burning power plant. The startling reversal came during an earnings call on February 22, 2017 at a time when Southern faces intense scrutiny from federal and state regulators and the Securities and Exchange Commission – – and as its Mississippi Power Company subsidiary, the plant’s owner, faces a Moody’s downgrade over Kemper’s skyrocketing costs and failure to operate despite being three years past its promised operating date. Southern took a 27 percent hit to its fourth quarter net income thanks to Kemper schedule delays. During the call, Fanning acknowledged that Kemper can only be feasible if it runs on natural gas as financial analysts questioned him about a just-released “economic viability” study by Southern that found that low gas prices for the long-term mean the plant can’t profitably gasify lignite in the gasifiers Southern spent most of $7.1 billion to build. Fanning’s comments came as the company announced it will soon file a rate case with the Mississippi Public Service Commission seeking to recover its costs for the plant. Although Fanning has often reassured Mississippians that they are protected by a $2.88 billion cost cap agreement limiting their liability for the plant’s runaway budget, he has failed to mention that once the plant is declared operational, the cap won’t protect them from additional costs of some $4 billion. That includes $200 million a year in operation and maintenance costs, a disturbingly high figure that keeps going up for the novel “clean coal” plant. To investors, Southern often touts its friendly relationships with state regulators in the four states in which its regulated utilities operate, but the fall 2015 Mississippi PSC election quickly became a referendum on Kemper, replacing two commissioners who reliably rubber-stamped MPC’s agenda with two new faces, Sam Britton and Cecil Brown, both of whom have pledged not to leave ratepayers holding the bag. A source close to the Public Service Commission told CIC recently that the PSC staff has run the numbers and that even under the cap, electrical rates could increase by 40 percent or more – a catastrophic burden for MPC’s 186,000 disproportionately lower-income customers in 23 counties in southern Mississippi. Critics have noted that a natural gas facility comparable to the 582-megawatt Kemper facility would have cost about $500 million. During the earnings call, Fanning did not draw the obvious conclusion and admit the plant will never actually use its twin gasifiers to produce electricity. In fact, while admitting the technology isn’t viable, Southern nevertheless claimed in its annual report filed last week that it plans to have the plant on-line with both gasifiers operating by mid-March. Mississippi Power already faces three lawsuits over allegations that it misrepresented when the plant would be completed and how much it would cost during the project’s seven-year history. Those allegations, aired in a front page New York Times story last summer, are also the subject of a probe by the Securities and Exchange Commission. 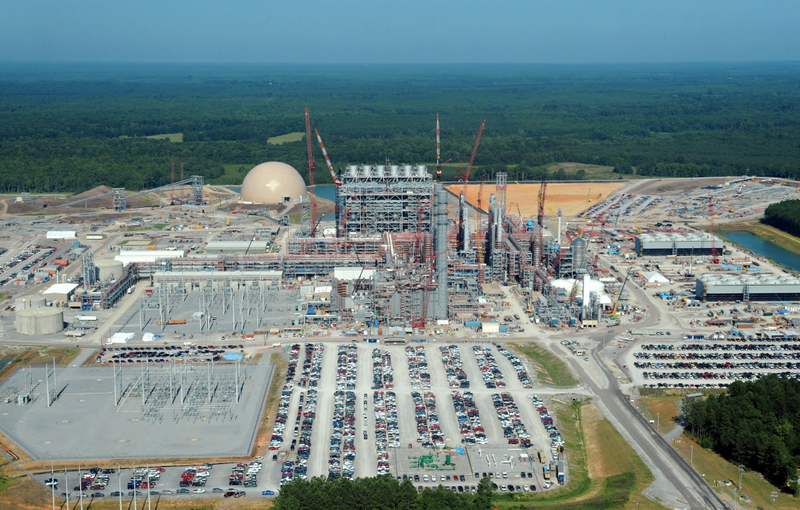 An important prong of Southern’s PR strategy seems to be to shift the blame for Kemper onto the PSC itself. During the earnings call, Fanning also said, as he has frequently of late, that Southern built the Kemper energy facility because the Mississippi PSC wanted a coal facility as a “hedge” against potential “double-digit” gas prices. However, documents obtained in a Freedom of Information Act request from the Department of Energy, which has provided a total of $407 million in grants for Kemper, demonstrate that the impetus for the facility came from senior management at Southern, including then-chief operating officer Fanning, and from Mississippi Governor and longtime Southern Company lobbyist Haley Barbour, who pressured first the Department of Energy, and then enlisted the secretary of energy himself, to pressure Mississippi’s three PSC commissioners into approving plans for the construction of Kemper. The documents also reveal that while possible gas price volatility was cited, Southern Company’s proposal relied almost entirely on the plant’s promise as a test case for cutting CO2 emissions from burning coal – especially lignite coal, a dirty, low-energy, but plentiful variety found in eastern Mississippi and throughout the world. Barbour was both a governor of Mississippi and still actively lobbying for the company in early 2008 when he and Southern officials launched an all-out campaign to convince the Department of Energy to transfer an existing grant to build a 285-megawatt coal-fired power plant in Orlando, Florida to a new site in Kemper County, near the Alabama border. Taking advantage of the availability of hundreds of millions of dollars from DOE’s Clean Coal Power Initiative, Southern doubled the size of the plant, added carbon capture and sequestration technology to the Orlando design, which used a first-of-its-kind technology developed by Southern Company and Kellogg Brown & Root (KBR) called transport integrated gasification (TRIG) to heat coal under high pressure in a reactor and turn it into a syngas similar to natural gas to drive a turbine to generate electricity. KBR and Southern hope that licensing the TRIG technology in coal-reliant countries like Poland where lignite is common will help pay back development costs. Notably, however, it had never been used to generate electricity. Angling for a sizable increase in support from DOE over what it received for its Orlando project, Southern tricked out Kemper with additional goodies. These included carbon capture equipment, plus a process to produce sulfuric acid from waste gasses. The plan was to strip out the CO2 and connect the plant to an existing network of CO2 pipelines, then inject the gas into older, underproducing Mississippi oil fields to push up more oil – a process known as enhanced oil recovery. In so doing, however, Southern now added further complexity and uncertainty to the still-untested TRIG system. On February 6, 2008, Eric Burgeson of BGR, Haley Barbour’s lobbying firm, requested that then-Secretary of Energy Samuel Bodman meet with himself, Barbour, then-Southern CEO-David Ratcliffe, and other officials Southern Company and Mississippi Power officials to discuss moving and expanding the DOE’s commitment from the Orlando project to Kemper. The initial cost projection was $1.2 billion. DOE would put up $270 million on top of $23 million spent in Orlando – where the project was already substantially over-budget. “Front-end Engineering and Design (FEED) is underway to support operation in Kemper County in June 2013,” Burgeson wrote, although Southern later admitted that very little FEED had been completed. Barbour had personally lobbied for Southern Company for more than a decade before he became governor and began representing it again upon leaving office in 2012. Despite the questionable ethics of a sitting governor working hand-in-glove with his own lobbying firm to reel in more than a quarter of a billion dollars in DOE money for Southern Company (Barbour defends himself by noting he put his 50,000 shares of BGR in a “blind trust” when he became governor), the meeting with DOE Secretary Bodman took place on February 26th. By the fall of 2008, a funding package of almost a billion dollars in DOE grants and federal tax credits was in place. By then the cost had already gone up to $2.4 billion and the schedule had been pushed back to spring 2014. DOE also waived repayment obligations for what was supposed to have been a loan. However, the PSC voted against the project in April 2010, then reversed its decision weeks later. In between, Barbour wrote the Commission urging approval, as did Secretary of Energy Steven Chu. James Markowsky, head of the department’s Office of Fossil Energy, responsible for developing new coal technologies, wrote several such letters to the PSC. There are reasons to doubt that the current PSC, despite campaign promises to the contrary, will actually hang tough with Mississippi Power if the utility tries to stick customers with an outsized bill for Kemper. While neither of the new commissioners – Sam Britton and Cecil Brown – has made a public statement on the project lately, Britton’s campaign manager during his PSC run was Austin Barbour, Haley’s nephew, and a principal in the GOP-focused Clearwater Group, whose other partner is Arnie Hederman, former chairman of the Mississippi Republican Party. Though his gubernatorial term ended in 2012, Barbour himself was deeply involved in the PSC races, and is believed to have hand-picked Britton to run in the Southern District against Democrat Tom Blanton, who financed a series of legal actions that overturned an 18 percent rate hike by Mississippi Power to help pay for Kemper. Britton is also connected to Barbour through his wife, Robin Robinson, director of organization, development and corporate communication at Sanderson Farms, the third-largest poultry producer in the country and a major Barbour financial and political backer. While governor, Barbour appointed Robinson to the board of trustees of the state’s Institutions of Higher Learning, which oversees public higher education. Britton spent more than $300,000 on the campaign, an enormous sum for a PSC race, most of which came from his own pocket. Barbour is thought to have agreed to back Robinson for lieutenant governor in the next election in return for Britton spending so lavishly on his PSC campaign. In his remarks to the analysts, Fanning leaned heavily on the argument that low gas prices had suddenly made the coal plant idea economically unsound. In fact, gas prices were trending far lower than Southern’s forecasts when the project was approved by the PSC in 2010, and opponents argued as far back as 2009 that the plant as proposed was uneconomic given natural gas prices. When the PSC held hearings in October 2009 to determine if the state actually needed additional electrical power, the Sierra Club pointed out that Mississippi already had 12 natural gas plants that sat idle 85 percent of the time and could provide up to 7,995 MW of power. Many of these were so-called merchant plants that were for sale for $500 million or less. Later, in April 2012, when the PSC reauthorized its approval for Kemper, Louie Miller, director of the Mississippi Sierra Club, complained to a reporter that the project was again being rubberstamped by a compliant PSC, ignoring ultra-low gas prices. “There is no way they can justify Kemper under current conditions in the energy market,” Miller said.